Q: You feel you played your best match of the week R. Nadal: I am sure about the first set – I need to see in the TV as your thoughts are not 100% exact but the first set was fantastic and I played a high level and everything well and no mistakes and changing direction and playing inside the court and good percentage on the times and dominating the point and following to the net and I think I played one of the best matches since I am back. Q: Are you a player that likes to peak at the French Open and build up. It must be great to play this well but is it so soon. R. Nadal: I am not this guy – I try the best every day and don't talk about Roland Garros before the Roland Garros and love every tournament in the clay court season in Europe and in every tournament has a big history and is important and so my feeling is that Rome, Madrid, Barcelona and Montecarlo don’t deserve to be the preparation for Roland Garros and I don’t feel these tournaments this way and I try and do my best and the Roland Garros is important but it is not the only tournament in the world. To win any of these is very important. R. Nadal: I was already yesterday number one but these are only numbers and in Rome I am in the right way and playing well regularly and not up and down and to play finals in Rome you have to be fresh mentally and I am and I am focused and happy what I am doing and this is not new for me and after what happened last year every match is important and I am enjoying every moment and 8 finals in a row is wonderful and 4 – 5 months ago it was impossible to think about this and what we have here today and I hope to play very well and I am very happy to win the final and any result will be a fantastic result and if I lose it will also be very good and so talking about the clay court season. R. Nadal: No – that is what happened at that moment and you need to write and this is what happened at that moment and we cannot lie about the past and they are fantastic players and at the end they are only one year younger that me and not 5 or 6 and they are very good and I am not saying that this cannot happen and they are 1 ad 2 and I am number 5 and I think that I am better that the number 5 of the ranking without 7 months with zero points …. It is am amazing number. Q: 2 days ago you talked about the level now and when you started from the beginning and which match you played well and Madrid and Barcelona. 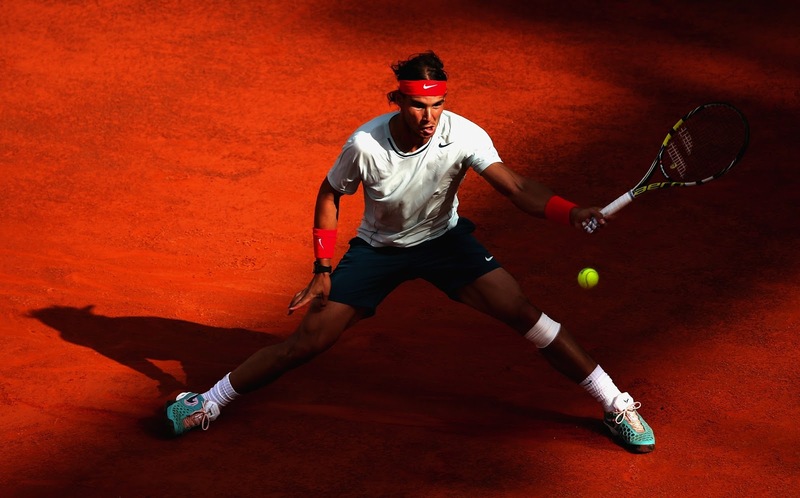 What is you level now compared to the best Rafa on clay – you win a lot. Which is the difference. Is it physical or what. R. Nadal: If my memory is not bad --- I'm not talking about you – but some of you thought about that some years ago and we are here in 2013 and he is number 2 in the world and I am number 5 after not playing months and we are still playing good and I hope that this is not going to be the last time and we will play tomorrow perhaps in the final. The results are there and you cannot be number 2 if you don’t play great for weeks and his results in the semis in Indian Wells and Wimbledon last year and the finals in the Olympics and he lost in the semi and then he played the final of the Masters Cup and this is not 2 years ago and then he lost in Indian Wells against me and he stopped for some months and then he lost against Nishgori and then not one week later had has a good chance to be in the final but I an not a specialist and I think that Roger is still here.